Since the 2011 tops, precious metals investors have had their patience severely tested. Six years later, silver is down 66% from the $50 peak and gold 35% off the $1,920 peak. We mustn’t forget off course that these metals started this century at $280 and $5 respectively. But that is no consolation for the investors who got in near the highs. The best time to buy an asset is when it is unloved and undervalued like gold and silver were in the early 2000s. What few investors realise is that the current levels of gold and silver, when real inflation is taken into account, are very similar to where the metals were in 2000-2. Thus gold at $1,265 and silver at $17 is an absolute bargain and unlikely to remain at these levels for long. Why are asset markets booming and gold static? As the precious metals have corrected for six years, many markets have boomed. Money printing and credit creation can do wonders to asset markets. Since 2009, stocks in the US for example have trebled and many other asset classes such as property have appreciated substantially. Global debt since 2006 is up by 75% or $100 trillion and short term and long term rates in the Western world re down from 5-6% to anywhere from negative to around 2%. This has fuelled stocks and property but so far had limited effect on gold and silver. It was the sub-prime mortgage market that started the 2006-9 crisis. Since then, there are property bubbles in many parts of the world. Canada, Australia, UK, Scandinavia, Hong Kong and China all have property markets which are likely to crash in the next few years together with the US one which is still a bubble. With most asset markets surging since 2009 why haven’t gold and silver. To answer that question, we need to take a slightly longer perspective. Since the beginning of this century, gold has outperformed most asset classes. The Dow for example is down 61% against gold since the beginning of 2000. Thus, gold has been an outstanding investment as well as being the ultimate wealth preservation asset in the 2000s. But since 2009, gold has not reflected the massive money printing and credit creation that has taken place. Many investors are comparing gold to Bitcoin. Bitcoin was $3 in 2011 and now $2,700 – a truly remarkable rise. I have previously noted that Bitcoin could be an excellent investment and that is proving to be the case. But Bitcoin has nothing to do with wealth preservation. Just like with paper money, there is no tangible asset backing it. Also, cryptocurrencies are totally dependent on an electronic world and the internet. So whilst Bitcoin could continue to go up in a speculative frenzy, it will never replace the only money which has survived for 5,000 years. Bitcoin is only one of many cryptocurrencies. New ones are being launched continuously and thus created in a similar fashion to how paper money is printed, thus without an underlying service or exchange of goods. The one major advantage that Bitcoin has and which makes it so popular is that is not controlled by governments and can therefore not be manipulated by them. If cryptocurrencies become too successful that could of course change. So currently Bitcoin is an investment which is not influenced by governments or manipulation. Investors love that they can buy something that is not interfered with by the powers that be. Sadly, the same cannot be said about gold and silver. Governments and central bankers have quietly admitted that they don’t like gold going up too fast and will therefore manage the rise. The reason governments dislike gold, is that it reflects their mismanagement of the economy. But as investors in physical gold know, the gold price is not going up but the value of fiat money declines continuously as governments issue more and more of it. Since 1913 when the Fed was created, all major currencies have declined 97-99% versus gold. The same has happened many times in history like when the Roman Empire collapsed. The silver content of the Denarius coin declined from 100% to 0% between 180-280 AD. Governments and central banks currently have a very effective way of manipulating the gold price and this is the main reason why gold so far has not risen like Bitcoin. But in due course this will all change. If we look at the gold paper market, the amount of paper trading is astounding. In 2016, $10 trillion of paper gold was traded in four exchanges with Comex in New York accounting for 76% or of that. $10 trillion is more than all the gold ever produced in history which is $7 trillion. But the paper gold traded on the futures exchanges is totally dwarfed by the amount traded by the LBMA banks in London. 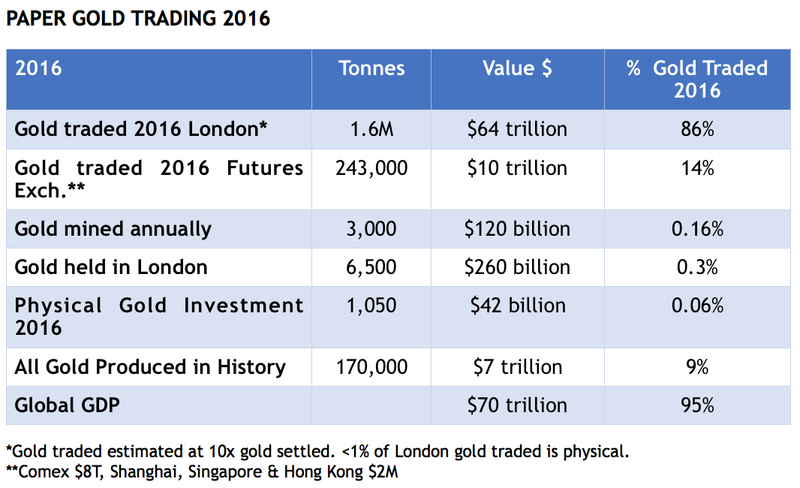 In 2016, the total estimated gold traded in London is estimated at $64T. Of that less than 1% is physical. Adding the LBMA and Futures Exchanges gold trading we get to an astounding $74T annually. Thus, the world trades more paper gold than goods and services since global GDP is $70T. And the gold traded in 2016 is over 600x the gold mined every year. Even more incredible is that the paper gold traded was 10x all the gold ever produced in history. With such vast amounts of paper gold traded, it is clear that the gold market today has very little to do with physical gold. The annual increase of physical gold in the world in 2016 was 3,000 tonnes or $120B. That is only 0.16% of all the gold traded in 2016. Thus, the gold price bears very little relation to the physical market since the gold price is settled by a paper market which is 600x annual gold mine production. As long as this false paper market in gold exists, it is of course easy to manipulate the price of physical gold with a 600 to 1 leverage in relation to annual production. Without the blatant manipulation of gold, the gold price would be many times the current price of $1,265. Global credit is growing at an exponential rate without any sign of abatement. Since 2006, the six largest central banks have printed another $13 trillion. During the same period, world debt has increased by 70% or $100 trillion. Governments are suppressing the gold price to conceal their fraudulent mismanagement of the economy. Chronic deficits like the US has been running for over 55 years combined with money printing to cover the debt, is totally scandalous and the most flagrant Ponzi scheme ever created in history. With record borrowings, interest rates would in a free market be at least 10-15%. Instead short term rates are at levels at which savers get a negligible return. Thus, the effect of governments’ disastrous policies is to rob normal people of a decent return on their money. Instead, banks and the wealthy can borrow money at virtually no cost and leverage it many times for substantial returns in inflated asset markets. Investors who hold physical gold understand the importance of wealth preservation. Although most of us know that the current gold and silver price has nothing to do with the real price of these metal. Because the real price is what we will see in coming years as the manipulation in the paper market fails and the holders of paper gold demand delivery. This is when all hell will break lose in the gold and silver markets and the price will go to no offer which means there will be no gold or silver offered at any price. For the people who understand that the debt and asset bubbles have got very little time left before they implode, physical gold and some silver is the ultimate insurance as long as it is not held within the financial system. For the few who hold physical gold and silver, patience is not the ability to wait for the collapse to happen but the reassurance that when it does you are fully protected. There are a few different signals I look at to time the turn of markets and when trouble will start in earnest. In my view, the US dollar is a leading indicator. The dollar, which is a bankrupt currency, will tell us when markets and the economy will turn. 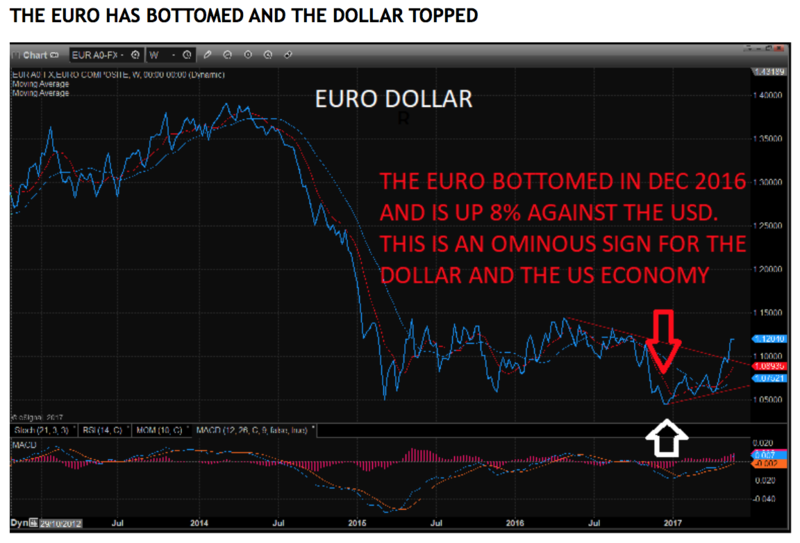 For years, all the “experts” have talked the Euro down and expected the dollar strength to continue. The Euro is of course a rubbish currency which is totally artificial and shouldn’t exists. On top of that the political and economic situation in Euroland is dire to say the least. But currencies are a relative game and the US has economic problems which are even greater than in Europe. The US is also the most debt laden country in the world. The dollar should have crashed long ago but the competition is so poor with badly managed economies around the globe so the dollar has held up due to its reserve currency status. But the dollar’s glory days are now coming to an end. It seems the dollar peaked back in December 2016 and that it is soon starting its journey down to the intrinsic value of zero. Often when markets turn there is a catalyst. The interesting observation is that currency markets are much more intelligent than stock, bond or metals markets. The main reason is that currency markets because of their size are very difficult to manipulate except when all central banks coordinate intervention. But today there is very little willingness from China or Russia for example to cooperate with the US. And even the US wants a weaker dollar. Trump’s election was taken badly by currency markets since the dollar turned down soon after his victory whilst stocks continued to boom. Another catalyst from the US is the political situation. There is now daily sensational news coming from Washington. Certain circles seem determined to get rid of Trump. He might even get so fed up that he resigns himself. The likelihood that he stays the four years is decreasing by the day. The other indicator that I watch carefully is the gold silver ratio. This ratio turned down in February 2016 from above the 80 level. This is the third time in the last 14 years that we see a turn at that level. 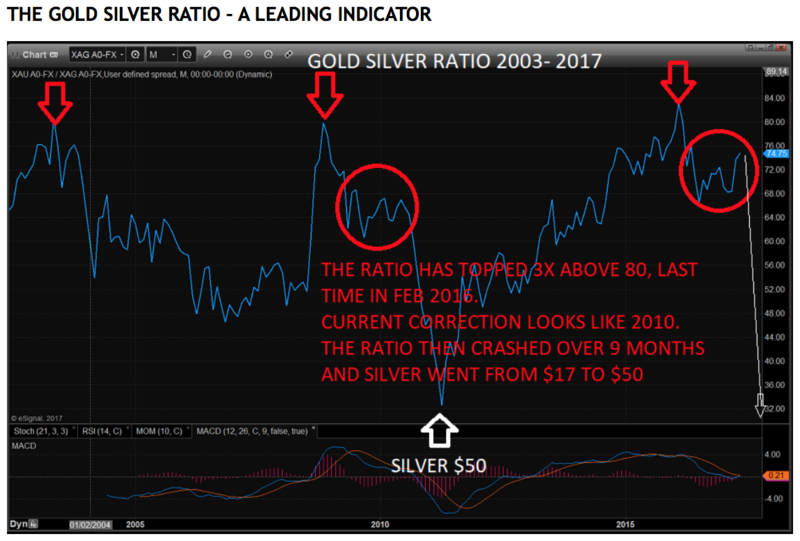 After a peak in the ratio in 2008, the real collapse came in 2010-11 when the ratio crashed over a nine month period and silver surged from $17 to $50. The corrective pattern currently looks very similar to 2010 before the big fall in the ratio. When the gold / silver ratio turns down and falls strongly, this is a sign of very strong precious metals and a weak dollar. This is exactly what happened in 2010-11 as the ratio was collapsing. So it is likely that we will see major turns in all markets either before the summer ends or possibly we get final moves ending in the early autumn. In either case, we will soon see in 2017 the beginning of collapsing stock markets around the world together with a strongly falling dollar. Bond markets will also come down in spite of central bank attempts to keep interest rates low. The main beneficiaries of the coming crisis will be of course be physical gold and silver. Central banks will lose their ability to manipulate these markets and we will realise what the real price of gold and silver is. It is likely to be multiples of the current price. There is still time to protect assets against the coming shocks but that time is very, very short. Tagged Bitcoin, Ponzi scheme, US dollar collapse.